The Franciscan movement is widely known for its Christocentric spirituality. Francis of Assisi cherished profoundly the mysteries of Christ's life, especially the mystery of the Incarnation and the mystery of Redemption. Franciscan sanctuaries like Greccio and La Verna are living reminders of Francis' deep devotion to the humanity of Christ. They are like replicas of the Holy Places which Francis visited in 1219-1220, when he went to the Orient as a herald of evangelical peace. Other Franciscan saints followed in their founder's footsteps. Anthony of Padua, Bonaventure of Bagnoregio, John Duns Scotus, Bernardine of Siena are just a few in a long list of mystics, preachers and theologians, who developed the simple spirituality of the Poverello into one of the foremost schools of theological thought in the history of the Church. The Franciscan school is characterised by its devotion to the humanity of Christ. Indeed, the same monuments of art which sprang up in honour of Francis, are also reminders of a typically humanistic approach to theology. The mysteries of Christ's birth in Bethlehem and his death and resurrection in Jerusalem are always present in famous monuments in honour of the Poverello. Such is the case of the frescoes in the lower basilica of Saint Francis in Assisi. In this paper we intend to view a particular theme in Franciscan theology, which is intimately linked to the mystery of the Incarnation. We shall see the constant devotion of Franciscans towards the infancy narratives of the Gospels of Matthew and Luke, as expressed in the same Holy Places of which the Franciscans are the custodians, as well as in the writings of two famous Franciscan saints, namely Bonaventure of Bagnoregio and Bernardine of Siena. We shall speak particularly about their devotion to Joseph, the husband of Mary, and the great role which the Franciscans have played in spreading devotion towards this particular saint, within the context of the mystery of the Incarnation. The infancy narratives of Matthew and Luke often mention Joseph as a "righteous man". He is seen to be a key-figure in the early years of Jesus' life. He comes from the lineage of the royal house of David, and has to go to Bethlehem with Mary his wife, who gives birth to the Son of God and places him in a manger. Joseph becomes an eloquent example of the "obedience of faith". In his silence he obeys God's messenger and accepts Mary as his wife. He gives the name Jesus to the new-born babe, and after fleeing to Egypt to escape Herod's hatred, he retires with the Holy Family to the town of Nazareth in Galilee. These evangelical episodes, so dear to every Christian, have become immortalised in the Holy Places where the Franciscans have been present for over 770 years. Among these places, Bethlehem and Nazareth are closely associated with Joseph and his role in the infancy narratives. The Holy Land is the place in which devotion to Saint Joseph started in its most authentic form, that is, within the context of the mystery of the Incarnation, centred in Nazareth and Bethlehem, and in the infancy narratives of the Gospel. The same devotion is also the result of further meditation upon the role of Joseph in the apocryphal writings of the first centuries of Christianity. The relative silence of the Gospels regarding Joseph's ancestral roots and his subsequent role in the adult life of Jesus was a lacuna which these writings tried to fill up. The historical truth underlying such narratives can easily be discarded as legendary, but not without the danger of ignoring the precious testimony of the first generations of Judeo-Christian communities which flourished near the Holy Places. The assertion that devotion to Saint Joseph in the Latin Church is fairly recent has to be seen also within the context of devotion to this saint in the Orient, which certainly dates back to the early centuries of Christianity. In the Holy Land, however, devotion to Saint Joseph was never dissociated from the evangelical context of the infancy narratives of Matthew and Luke, namely, that of seeing Joseph as a part of God's salvific plan in its early stages, and always within a reverential silence with respect to the eloquent roles of Jesus and the Virgin Mary. The Franciscans who went to the Holy Land in the 13th century, continued to cherish these devotions, fruit of the living memories of the early centuries of Christianity, and spread them across Europe. The writings of Franciscan theologians of the 13th and 14th centuries point to a clear idea of the important role of Joseph of Nazareth with the context of the mystery of the Incarnation. They were instrumental in spreading a genuine devotion to this saint wherever the Franciscans established their friaries. These writings have also been instrumental in further theological research on the unique figure of Joseph, which has characterised the more recent centuries in Church history. Saint Bonaventure (1217-1274), the Seraphic Doctor, speaks about Saint Joseph in two of his theological writings, namely in the Commentary on the Gospel of Saint Luke, and in his Sermons. In the Commentary on Saint Luke Bonaventure mentions Joseph of Nazareth various times when explaining the infancy narratives in Luke 1-2. He comments upon the attribute of "righteous man" given by Luke, and sees in it a proof of Joseph's integrity as the pure husband of the Virgin Mary, as well as a sign that he became a witness of Mary's own virginity . Bonaventure insists that Joseph was the descendant of Jacob, according to what Matthew states in the genealogy of Christ. In this way he belongs to the house of David, to whom God sent the promise of salvation . The birth of Christ in Bethlehem is a sign of the fact that both Joseph and Mary were descendants of David. 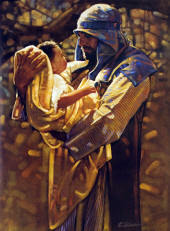 Joseph was considered to be Christ's father. The Latin term, so popular in Catholic theology, is pater putativum . The term, however, does not in any way diminish the uniqueness of Joseph's ministry as the custodian of the Holy Family and as Christ's father in the legal sense. This is best seen when Bonaventure mentions Christ as Joseph's adoptive son or as a son to be educated. This last reference to Joseph's ministry as a father who educates his son is indicative of the greatness of Joseph as a man who fully assumes the responsibility of a father, even though his son was born of the Holy Spirit . The greatness of Joseph consists in the fact that, as Bonaventure points out, Mary indicates her husband as Jesus' true father when the parents find the adolescent Jesus in the temple. Bonaventure, therefore, speaks about Joseph's role as only secondary to that of Mary. He traces the various moments in which Joseph appears as the one whom God chose to guard and protect the Holy Family, according to the infancy narratives of Saint Luke's Gospel. Bonaventure's Sermons are also full of references to Saint Joseph, when it comes to commenting the infancy narratives. The figure of Saint Joseph stands out prominently in the Sermons of Advent and the Christmas season. In fact, the liturgy allots a special place to Saint Joseph during this liturgical season. Bonaventure states that Joseph, the husband of Mary, was descended from a royal lineage[7 ]. Joseph becomes an eloquent example of obedience of faith . That is why, in Christ's nativity, one has to contemplate Joseph's reverence towards the mystery of the Incarnation, his sense of righteousness, his obedience to God's plan of salvation, and his profound charity towards Christ and the Virgin Mary . Moreover Joseph excels in divine piety, a virtue which is one of the noble gifts of the Holy Spirit . The Incarnated Wisdom, that is the Word made flesh, becomes the great sacrament of piety, and Joseph, together with Mary, becomes the first witness of devotion in front of the mystery (sacrament) of the Incarnation. Joseph also becomes for Bonaventure an eloquent example of humility in work. Like many other spiritual writers in Christian tradition, Bonaventure interprets the evangelical figure of Joseph of Nazareth as one referring to a faber lignarius, or carpenter . Joseph becomes a model of a righteous man who lives with the work of his hands. In this way, together with the Virgin Mary, Joseph becomes an example of evangelical humility . After the Virgin Mary Joseph is a model for those who want to accept Christ with devotion and veneration, because he was the first one to accept the new-born Saviour with the eyes of faith . Saint Bernardine of Siena (1380-1444) is one of the most important saints in the Franciscan calendar. He was the propagator of the devotion to the Holy Name of Jesus, and the monogram Iesus Hominum Salvator IHS first used by this saint in his preaching tours in Italy. Bernardine was also one of the most famous reformers of the Franciscan Order during the 14th century, and is considered a pillar of the Friars Minor of the Regular Observance. As we shall see, in all probability we can trace the beginnings of popular devotion to Saint Joseph in the west to the merits of the Franciscan Observants, who spread devotion to the mysteries of Christ's Incarnation and Redemption wherever they established their friaries, including Malta. The reading for the Office of the solemnity of Saint Joseph is taken from a Sermon which Saint Bernardine delivered on the Vigil of the Nativity, and which is popularly known as the Sermon on Saint Joseph, Spouse of the Virgin. Part I: Regarding the nobility of the most holy Joseph according to the flesh. Chapter 1 - Regarding the nobility of the blessed Virgin according to the flesh. Chapter 2 - Regarding the natural nobility of the most holy Joseph. Chapter 3 - Regarding the nobility of Our Lord Jesus Christ, which he acquired from both parents. Part II: Regarding the triple grace which the Father reserved for Saint Joseph from all ages. Chapter 1 - Regarding how Saint Joseph was espoused to the blessed Virgin, and how he acquired perfection. Chapter 2 - Regarding the perfection which Joseph acquired in his life with the Lord Jesus. Chapter 3 - Regarding how Joseph alone was given by God to Christ, and how he had been forshadowed and promised in the patriarchs of the Old Testament. Part III: Regarding the reward of eternal glory to which Saint Joseph was elevated in soul and body. The structure of the Sermon is typically mediaeval, and characteristic of the erudite preaching of the 13th and 14th centuries. Saint Bernardine was not only a popular preacher who used the volgare , or the local Italian dialects, in his ministry. He was also a renowned scholar and wrote many Sermons in Latin, according to the norms which all preachers used to follow, especially in the Mendicant schools annexed to the most famous universities of Europe, like Paris, Bologna and Oxford. Bernardine is probably one of the few Saints during the middle ages who explicitly preached about Saint Joseph. One should not forget that, during the same time, a chancellor of the Paris university, Jean de Gerson (+ 1429) distinguished himself regarding his writings about Saint Joseph, especially in his Sermo de Nativitate gloriosae Virginis Mariae et de commendatione virginei sponsi eius Ioseph. This was a Sermon which he delivered to the Fathers at the Council of Constance on 8th September 1416. De Gerson defended the sanctification of Saint Joseph in his mother's womb, his immunity from concupiscence, and his resurrection and ascension into heaven. It is not surprising, therefore, that even Saint Bernardine of Siena defends these privileges which he gives to Saint Joseph. We note this quite clearly in the Sermon to which we are referring . However, we should note immediately that the Church has never officially sanctioned this theological idea as official doctrine, as it has done in the case of the Virgin Mary. Bernardine's Sermon, however, except for this last section to which we are referring, is full of genuine teachings regarding the personality and mission of Saint Joseph in the history of salvation, and the Church has chosen sections of this particular text as a reading for the Office of Saint Joseph. Bernardine of Siena, together with his Franciscan Observant confrères, invoked Saint Joseph as the patron saint of the Monti di Pietà, an institution which the Franciscans founded in order to protect the poor against the scourge of usury in the late Middle Ages. Another devotion to Saint Joseph which the Franciscan Order cherished was that of celebrating the feast of the marriage of Saint Joseph with the Virgin Mary on 23 January. This feast was introduced in the Franciscan calendar in 1537, even though it is important to note that the Franciscans regarded it always primarily as a feast of the Virgin Mary and not as another feast of Saint Joseph. The solemnity of Saint Joseph, celebrated on 19th March, was introduced in the Roman Missal and Breviary by a Franciscan Pope, Sixtus IV in 1479. Originally it was celebrated only in Rome, but on the request of the Conventual Franciscans, the same Pope approved the Mass of Saint Joseph for the Franciscan Order. We have only dealt with two of the most famous Franciscan theologians and preachers. The devotion to Saint Joseph in the Franciscan Order was also the result of other Franciscan mystics and writers, like Pier Jean Olieu (+ 1289), Ubertino di Casale (+ 1325) and Bartolomeo da Pisa (+ 1401). It is of interest to note that these men formed part of the Spiritual party in the Order, which was the forerunner of the Observant family. When one notes the intimate link between the Franciscans, who have been in the Holy Land Custody for nearly eight centuries, and the Holy Places such as Nazareth and Bethlehem, linked with the infancy narratives of the Gospel, one can easily deduce the importance which the Franciscans attached to a particular devotion to Saint Joseph, in the same places where the local Judeo-Christian communities perpetuated the Gospel texts even through oral traditions. The Franciscans have been the ones who have continued to cherish and take care of these places, who have organised excavations in order to unearth the original spots where the Word was made flesh, who have studied the apocryphal texts coming from the early Judeo-Christian communities. The Franciscan saints and mystics of the 13th and 14th centuries have continued to develop a theological synthesis which the Church has used both for liturgical texts as well as for documents relating to Saint Joseph .